Positive Slope x y m > 0 Line rises from left to right. 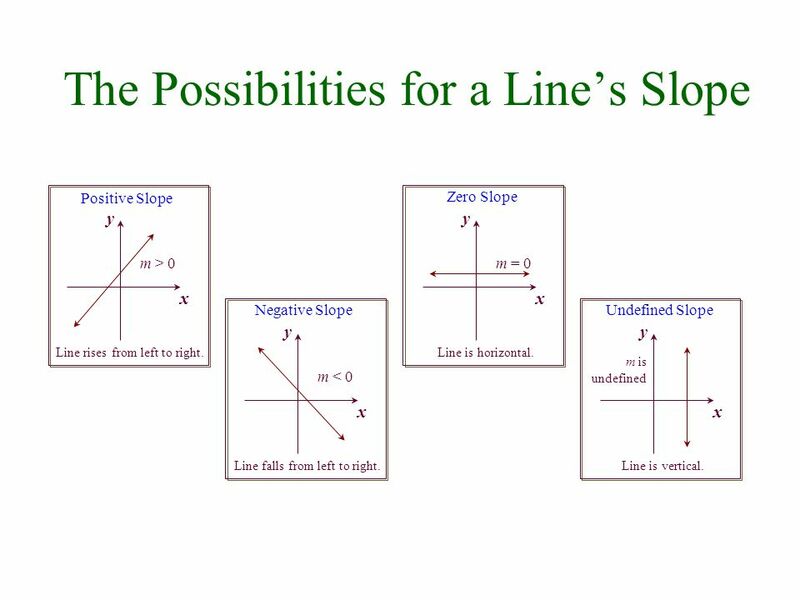 Zero Slope x y m = 0 Line is horizontal. Negative Slope x y m < 0 Line falls from left to right. m is undefined Undefined Slope x y Line is vertical. The point-slope equation of a nonvertical line of slope m that passes through the point (x1, y1) is y – y1 = m(x – x1). 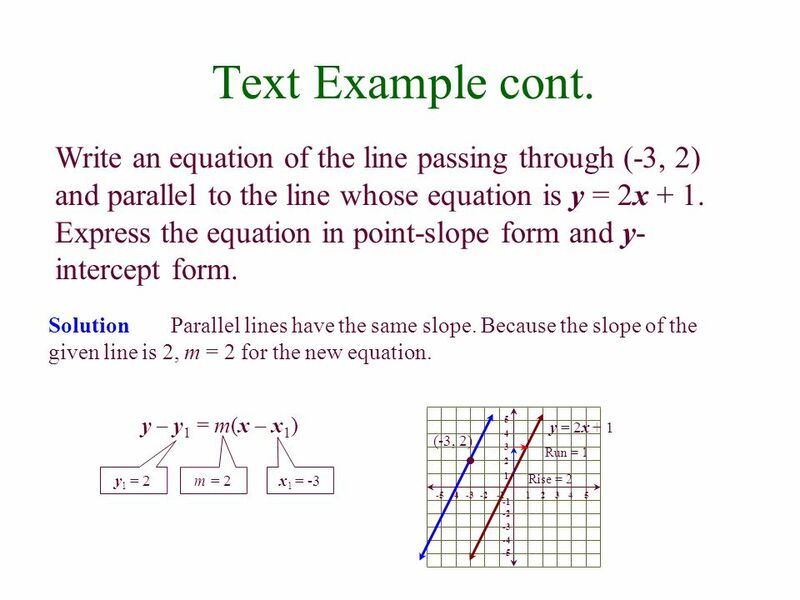 5 Text Example Write the point-slope form of the equation of the line passing through (-1,3) with a slope of 4. Then solve the equation for y. Solution We use the point-slope equation of a line with m = 4, x1= -1, and y1 = 3. 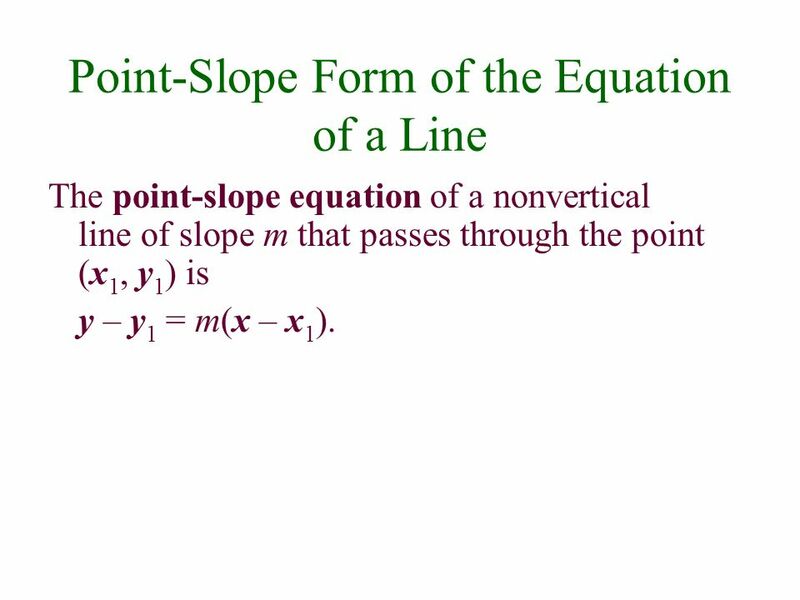 This is the point-slope form of the equation. y – y1 = m(x – x1) Substitute the given values. y – 3 = 4[x – (-1)] We now have the point-slope form of the equation for the given line. y – 3 = 4(x + 1) We can solve the equation for y by applying the distributive property. y – 3 = 4x + 4 y = 4x + 7 Add 3 to both sides. 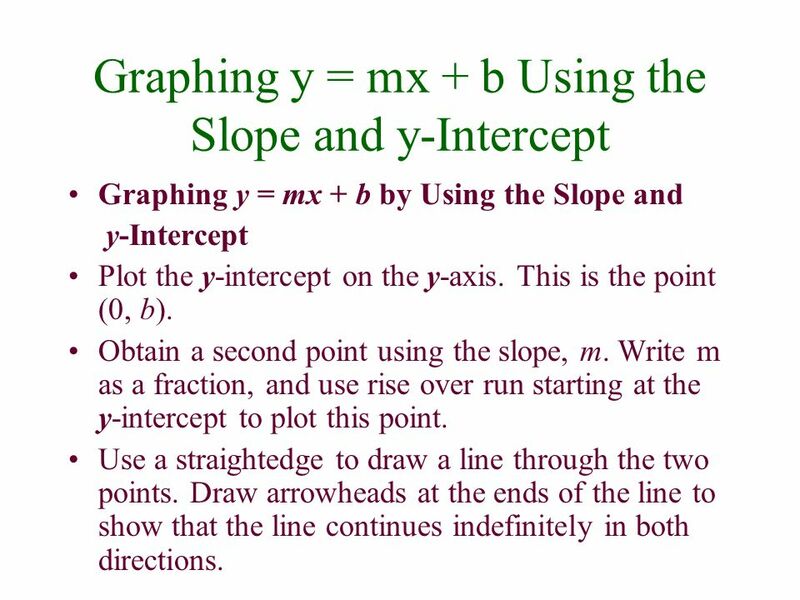 The slope-intercept equation of a nonvertical line with slope m and y-intercept b is y = mx + b.
Graphing y = mx + b by Using the Slope and y-Intercept Plot the y-intercept on the y-axis. This is the point (0, b). Obtain a second point using the slope, m. Write m as a fraction, and use rise over run starting at the y-intercept to plot this point. Use a straightedge to draw a line through the two points. Draw arrowheads at the ends of the line to show that the line continues indefinitely in both directions. 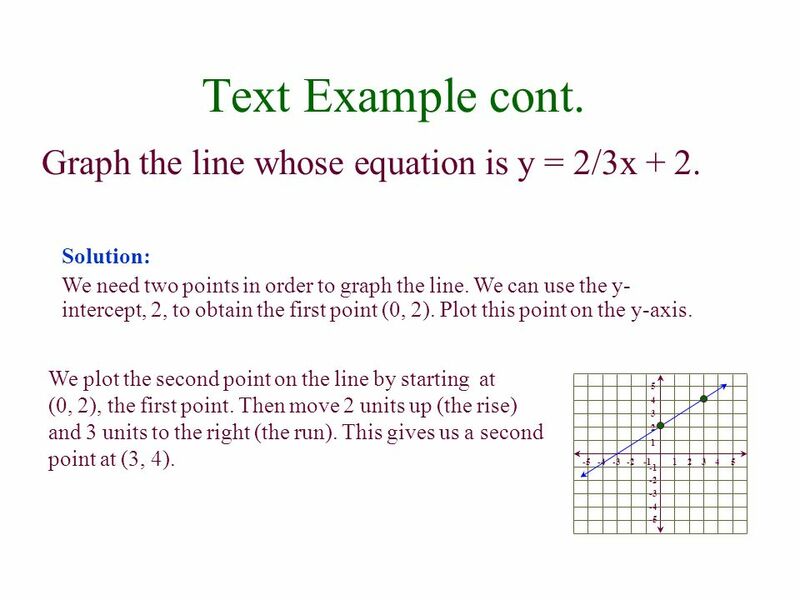 8 Text Example Graph the line whose equation is y = 2/3 x + 2. Solution The equation of the line is in the form y = mx + b. We can find the slope, m, by identifying the coefficient of x. We can find the y-intercept, b, by identifying the constant term y = 2/3x + 2 The slope is 2/3. The y-intercept is 2. 9 Text Example cont. Graph the line whose equation is y = 2/3x + 2. 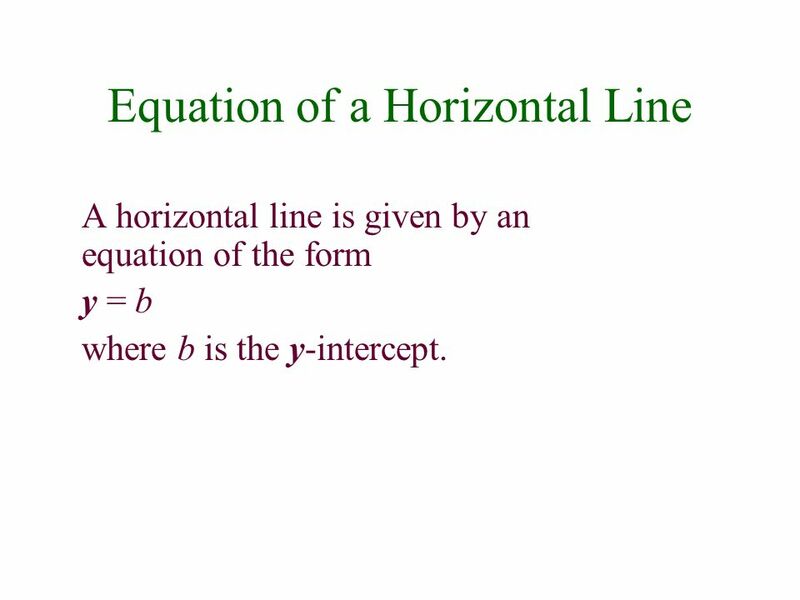 A horizontal line is given by an equation of the form y = b where b is the y-intercept. 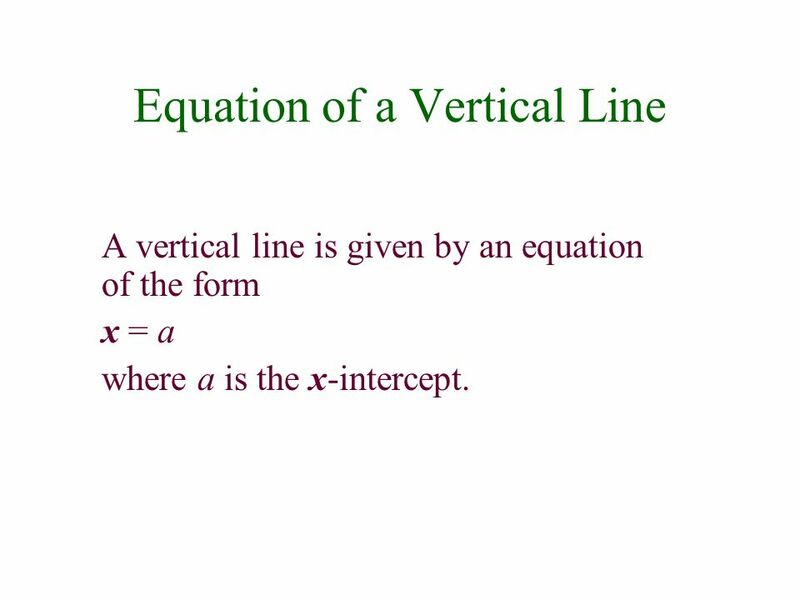 A vertical line is given by an equation of the form x = a where a is the x-intercept. 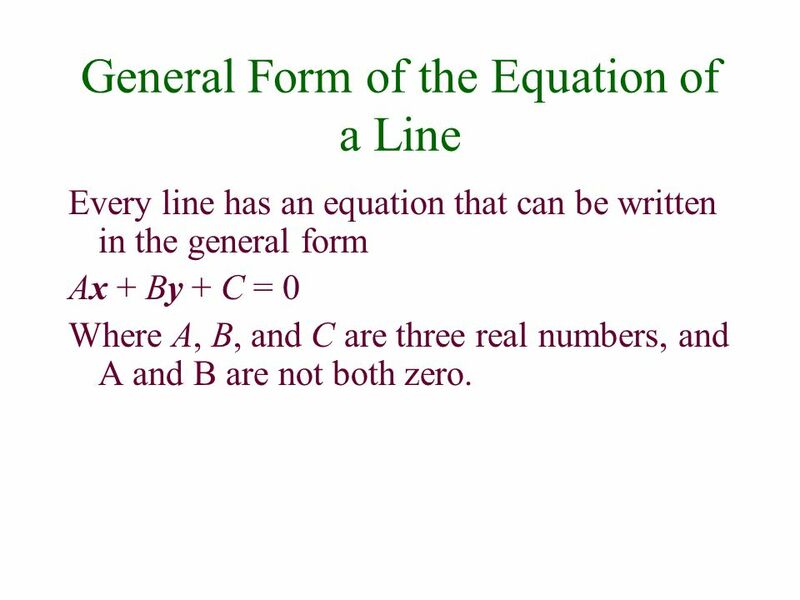 Every line has an equation that can be written in the general form Ax + By + C = 0 Where A, B, and C are three real numbers, and A and B are not both zero. 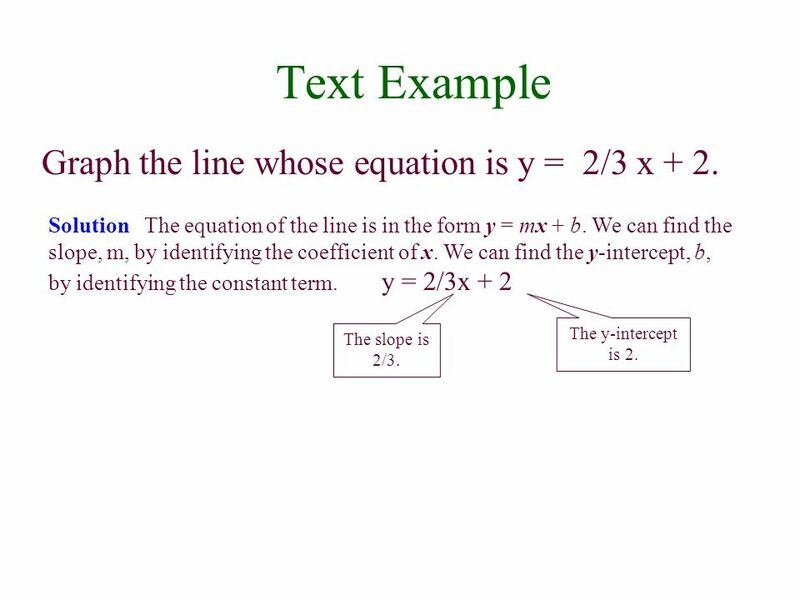 13 Text Example Find the slope and the y-intercept of the line whose equation is 2x – 3y + 6 = 0. Solution The equation is given in general form. We begin by rewriting it in the form y = mx + b. We need to solve for y. This is the given equation. 2x – 3y + 6 = 0 To isolate the y-term, add 3 y on both sides. 2x + 6 = 3y Reverse the two sides. (This step is optional.) 3y = 2x + 6 Divide both sides by 3. y = 2/3x + 2 The coefficient of x, 2/3, is the slope and the constant term, 2, is the y-intercept. If two nonvertical lines are parallel, then they have the same slope. If two distinct nonvertical lines have the same slope, then they are parallel. 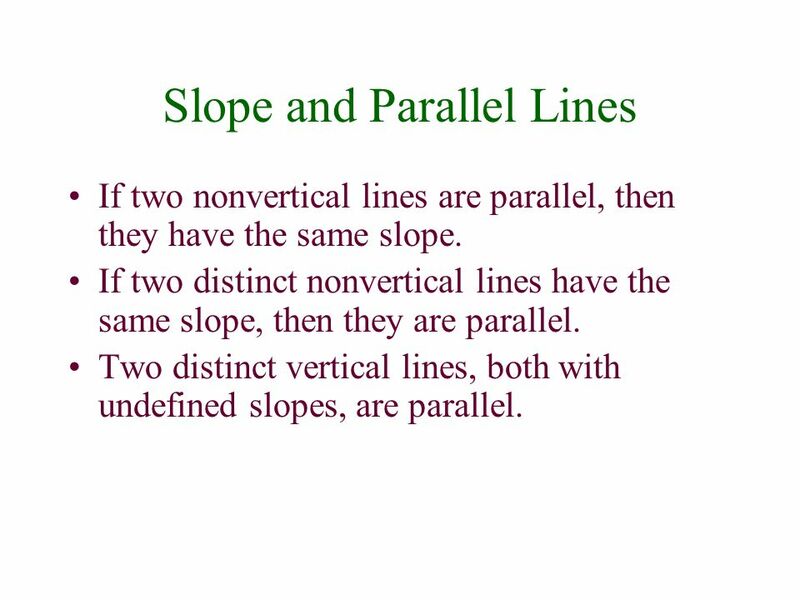 Two distinct vertical lines, both with undefined slopes, are parallel. 18 Text Example cont. Write an equation of the line passing through (-3, 2) and parallel to the line whose equation is y = 2x + 1. Express the equation in point-slope form and y-intercept form. 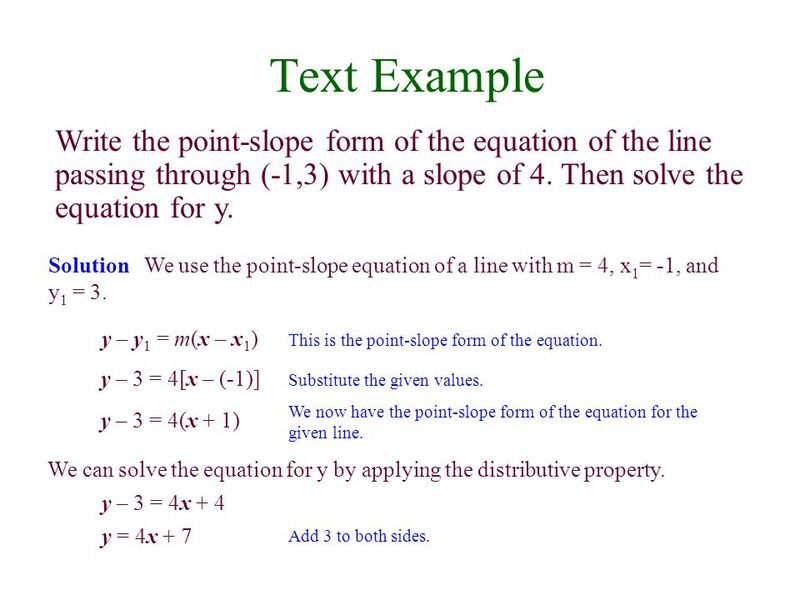 Solution	The point-slope form of the line’s equation is y – 2 = 2[x – (-3)] y – 2 = 2(x + 3) Solving for y, we obtain the slope-intercept form of the equation. y – 2 = 2x + 6 Apply the distributive property. y = 2x + 8 Add 2 to both sides. 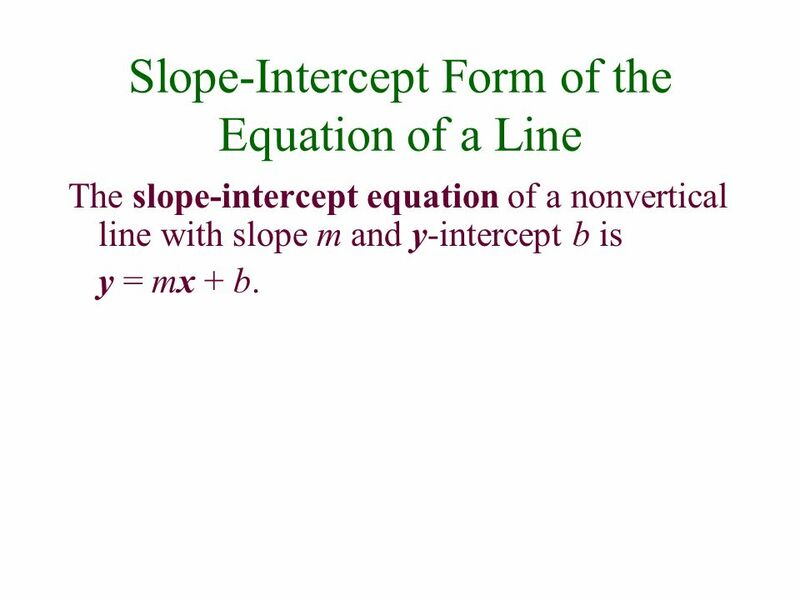 This is the slope-intercept form of the equation. 90° Two lines that intersect at a right angle (90°) are said to be perpendicular. There is a relationship between the slopes of perpendicular lines. 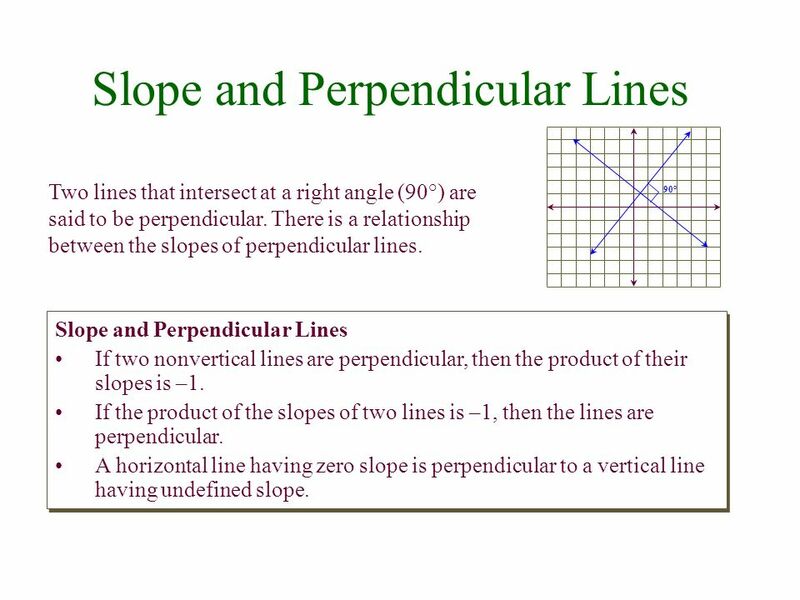 Slope and Perpendicular Lines If two nonvertical lines are perpendicular, then the product of their slopes is –1. If the product of the slopes of two lines is –1, then the lines are perpendicular. A horizontal line having zero slope is perpendicular to a vertical line having undefined slope. 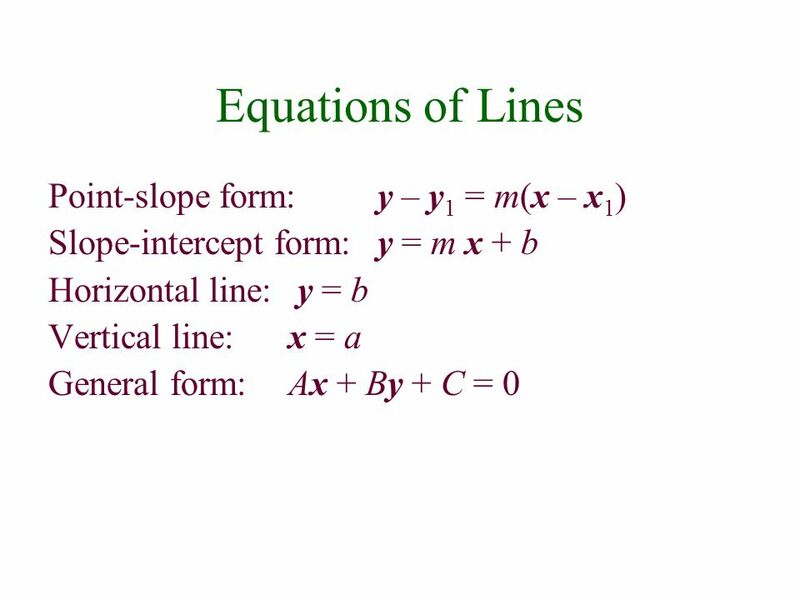 20 Example Find the slope of any line that is perpendicular to the line whose equation is 2x + 4y – 4 = 0. 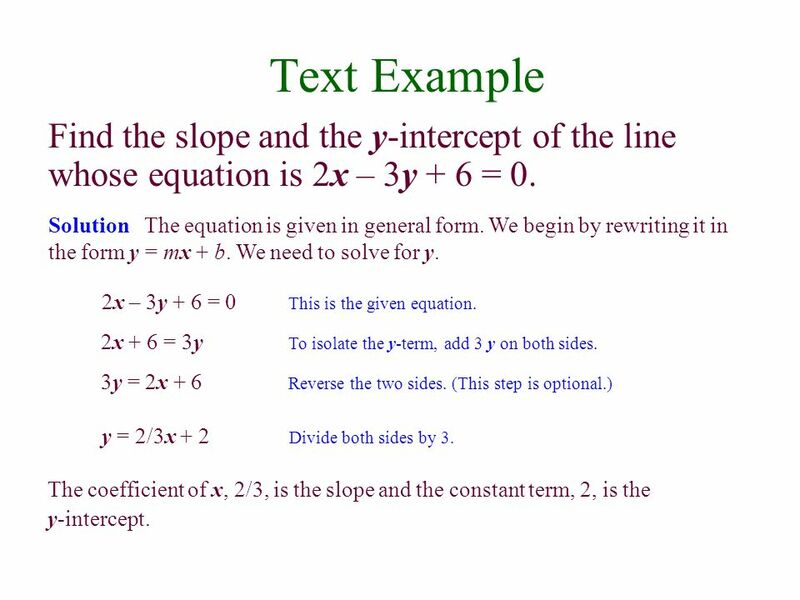 Solution	We begin by writing the equation of the given line in slope-intercept form. Solve for y. 2x + 4y – 4 = 0 This is the given equation. 4y = -2x + 4 To isolate the y-term, subtract x and add 4 on both sides. 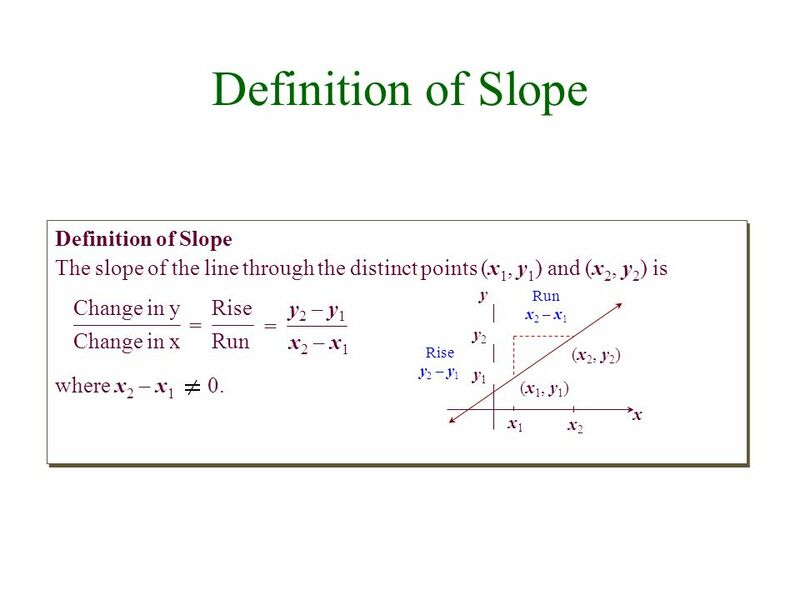 Slope is –1/2. y = -2/4x + 1 Divide both sides by 4. 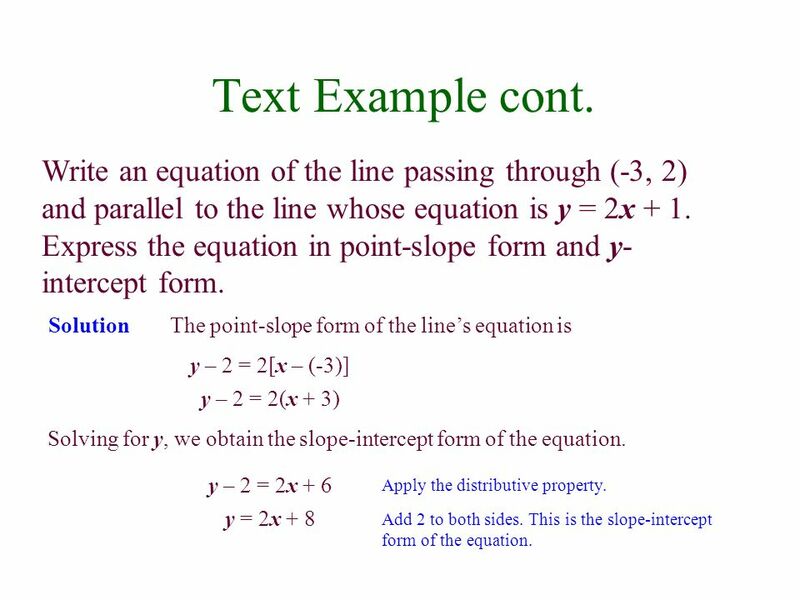 The given line has slope –1/2. 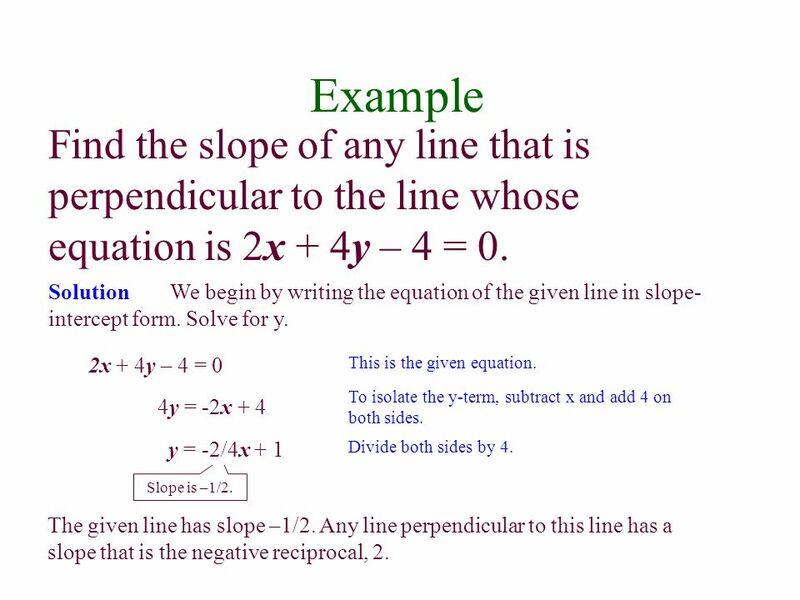 Any line perpendicular to this line has a slope that is the negative reciprocal, 2. 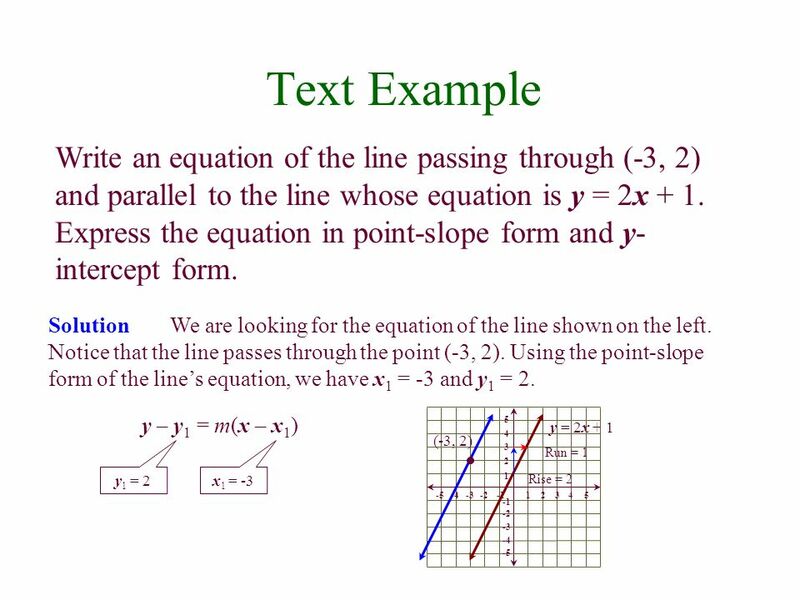 Download ppt "1.4 Linear Equations in Two Variables"
§ 2.4 The Slope of a Line. 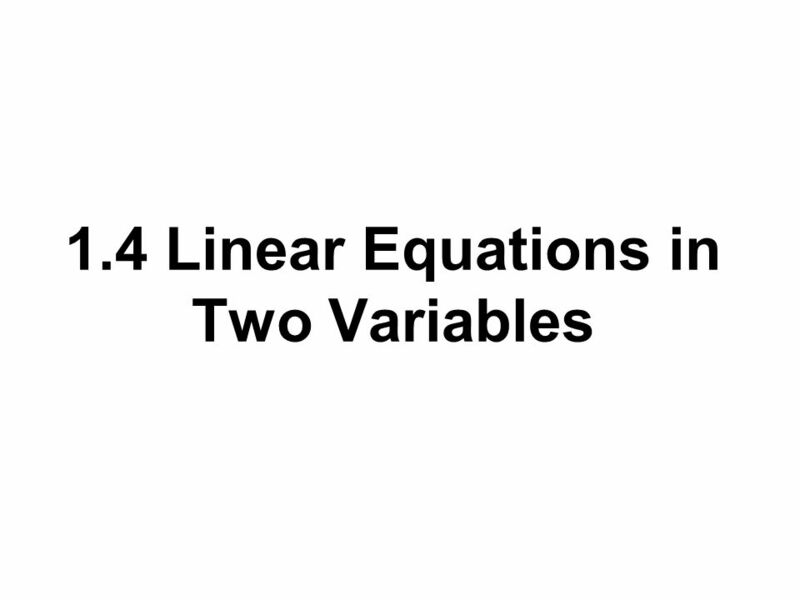 1.4 Lines Essential Question: How can you use the equations of two non-vertical lines to tell whether the lines are parallel or perpendicular? Do Now 6/3/10 Take out HW from last night. Take out HW from last night. Text p. 407, #8-10, evens Text p. 407, #8-10, evens Copy HW in your.